My name is Daniel Meyer. I am 27 years old and an Iraq and Afghanistan war veteran. I have been diagnosed with a terminal illness called Bronchiolitis Obliterans. 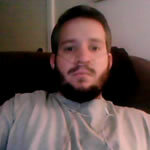 This disease scars off my bronchiole tubes until my body is no long capable of producing oxygen. I am on an oxygen machine 24/7 and will be for the rest of my life. I have had many other medical problems arise during this illness, but they are minor in comparison. As difficult as life is with this disability, it could be much worse. I am lucky enough to have my faith in God and an amazing support system in place which includes my wife, family, and friends. These are absolutely essential to live a semi-normal life free of deep depression and angst of what the future may hold. The key is to live life one day at a time. Every morning I wake up I thank God I was granted with the gift of life for another day. Everyone has good days and bad days, but what really matters is starting each day with a positive attitude. My ups and downs may be more extreme than the average person but I still live my life based on this philosophy. In addition to this, setting goals and striving to achieve them is a great way of keeping your mind active and occupied when your physical abilities have been severely limited. I have set out the goal to inspire people with my writing by starting a blog. I write about anything that comes to mind, but my focus is on inspirational content. I hope my work reaches as many people as possible so that my passion for writing can be enjoyed by all. If you suffer from a major illness, or know someone who is, understanding that God is with you every step of the way will help you endure even the most difficult of times. Please stay strong and even if your condition is unable to be treated or cured (as mine is), realizing you only have two options puts life into great perspective: You can either stay positive and want to live the remainder of your life to its fullest, or fall into a self loathing depression and give up on life. Which do you choose? My husband, at age 29, had a terminal cancer and had a very positive approach on being ill. It made it much easier on me. He passed away within 3 years of illness. He's been gone for 12 years. It was very hard losing him, but his will and living life to fullest was so inspirational to me. I have a boyfriend now, been dating 6 months, and only 3 months into our relationship has acute liver failure. He doesn't want to get out of bed. He has me waiting on him hand and foot, and it's exhausting when someone has no will. It is wearing me down and makes me want to run away. I'm trying to be compassionate, but it's hard. I'm glad you have the more positive approach on life!!! And yes, God, is where you get it from!!! I agree. When you get ill it helps put "life" and "living in proper perspective"(at least for me it did). Funny when I was much younger I felt invicible. But aging has its way of creeping up on you. When we are born even though the body renews itself every 7 years or so, we never know what can go wrong with the body. For me, illness taught me more compassion for others and now I'm working on having even more compassion for myself.